The Doore of Red Death. A24’s highly anticipated horror film It Comes at Night by writer-director Trey Edward Shults looks beautiful and beckons for attention, but fails to live up to the storytelling and payoff of A24’s The Green Room. Another A24 film in the vein of It Comes at Night is 2016’s The Witch, which was ultimately a failed attempt to capture the magic of a horror/mystery film and leave audiences with too many unanswered questions. The only “terrifying ambiguity” (to quote The Huffington Post), in this film, is just how terrifying it is to realize you just dropped money on a film that works better for Netflix, and the ambiguity comes from the plethora of underdeveloped plot elements. 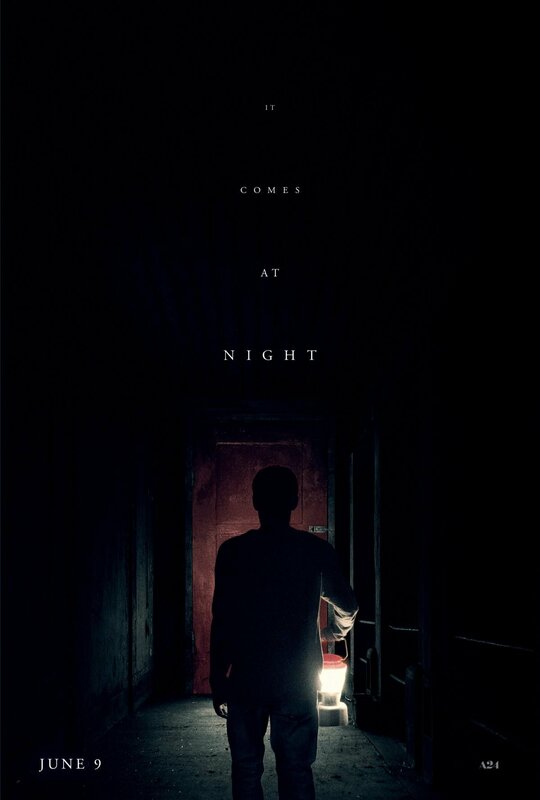 Essentially, It Comes at Night reminds me of a bad M. Night Shyamalan film (before he made his outstanding comeback with The Visit and Split) and after the successes of The Sixth Sense and Lady in the Water. Like the aforementioned era of ehh Shyamalan films, the wind up is excellent but the delivery lacks any emotional impact and you’re left with realizing that you never truly cared about any one of the characters. Character development is lacking, and the third act is incredibly weak. However, there is something in particular that I find very interesting; and after reading other reviews, it seems to be something that has escaped most (if not all) the critics at this point. That is the striking similarities between this film and the timeless classic short story The Masque of Red Death by the brilliant Edgar Allan Poe. From the painting on the walls of the house depicting the bubonic plague to the ominous red door, there are quite a few parallels between It Comes at Night and The Masque of Red Death. Nestled deep in the woods is a secluded boarded up house belonging to a family of three seeking refuge from an unknown threat. Whatever has caused this family to live off the grid and fend for their very survival is tasteless and odorless. Forced to wear gas masks whenever venturing out into the woods and even around their own home, the family is forced to take drastic measures to ensure there ability to avoid coming into direct contact with the disease. With only now way in or out of the house guarded by a red door, the family has stopped at nothing to protect themselves. One night, the family’s house is broken into and they must decide what to do with the man and his family. Having dispensed with courteousness and generosity in order to guard against any and all possible threats, the family must decide whether to listen to the man or kill him right then and there. Their decision will spark a fire that spreads into their deepest fears. *spoiler alert* But, the analysis is fascinating. Okay, now I know that the preceding paragraph describes what should be a brilliant horror film, but the problem lies in the greatly flawed poor storytelling, development, and realization. Lack of connection to any one of the characters is also partly responsible for the lackluster experience of watching this horror-thriller with a hint of mystery and dystopia. The only saving grace the film has is the connection to elements of Poe’s Masque of Red Death. For starters, the camera draws the audience’s (and diegetic POV) attention to a painting of a depiction of the bubonic plague (or black death). At first, I was puzzled as to why this painting. Then as I go through the movie, I realize why. Between the constant reference to and runtime spent on talking about and showing the red door, it hit me that this film reimagined Poe’s short story and set it in a dystopian or post-apocalyptic time and place. If you are unfamiliar with The Masque of Red Death, then I encourage you to read it or watch it on YouTube. It is allegory on the inevitability of death no matter how hard you protect yourself, how much money you have, or how powerful you are. It also contains allusions to the seven deadly sins and the fate of those who party in the wake of mass death among a lower class of people. Although I find the short short to be a stronger narrative than Shults’ variation on this reimagination of the classic tale. Both the short story and this film contain people hiding out in a fortress. Whereas The Masque of Red Death‘s Prince Prospero is held up ins abbey with his wealthy and noble friends while the red death is killing off the rest of the kingdom, A24’s It Comes at Night features a typical American family living off the land and secured in their rather tutor-looking mountain lodge. Like in Red Death, the family in It Comes receives an uninvited guest one night. Here’s where we see some difference. In Poe’s story, the guest is dressed to attend the masquerade ball and in this film, the guest attempts to break into the home. Although both stories take different approaches to the second act, once thing is in common. And that is the taking in of an outsider. All through the second act, there are hints at something not being right–a constant uneasiness. That apprehension and anxiety regarding the unknown works in the respective stories favors. The emotional impact and psychological payoff differs between the short story and film. Yes, the endings are very similar but feel incredibly different. You’ll just have to read The Masque of Red Death and watch It Comes at Night to know for yourself. Than you! Finally somebody else besides myself picked up on the parallels with “Masque of the Red Death”. That was the first story I thought about when I left the theater. I’m shocked it hasnt been mentioned in other reviews of this film. Remember too one of the most famous lines in “Masque of the Red Death” is “He [the Red Death] had COME like a thief in the NIGHT” An (possibly unintentional?) titular shoutout? I agree! We cannot be the only two who have picked up on this. I mean, c’mon…the RED door??? And yes, I should have mentioned that in my quote. Thanks for reminding me of that passage. There are just too many parallels to ignore. But I am shocked as to how many official critics and patrons alike have not noticed it. Yes, yes! Even if there are no overt supernatural elements in the story, the dreams and hallucinations the son has basically make up for that. They personify the disease in various ways (the grandpa, the wife, etc. ); so even that aspect of the story is accounted for. I don’t know. Most of the reviews I perused through seemed more interested in reading into the movie parallele with Trump America. Thats pertinentry too, but let’s not forget the classic references! Anyways good job on this review and thanks again!